In the 1930s, the recently renovated Catonsville Elementary School located on Bloomsbury Avenue was once a high school that refused to enroll African-American students—a practice typical of the segregation era. A 13-year-old named Margaret Williams—who happened to be the aunt of Baltimore County Delegate Adrienne Jones and Director of Recreation and Parks Barry Williams—her father Joshua Williams, and a young attorney named Thurgood Marshall, sued principal David Zimmerman, the county and school board for denying Margaret and a classmate admittance on Sept. 10, 1935. Marshall, who later because the first African-American justice on the U.S. Supreme Court, would lose the case of Williams vs. Zimmerman in the Maryland Court of Appeals. The court found that Williams wasn’t admitted because she failed Catonsville High’s admission test, although she had been promoted through elementary school. 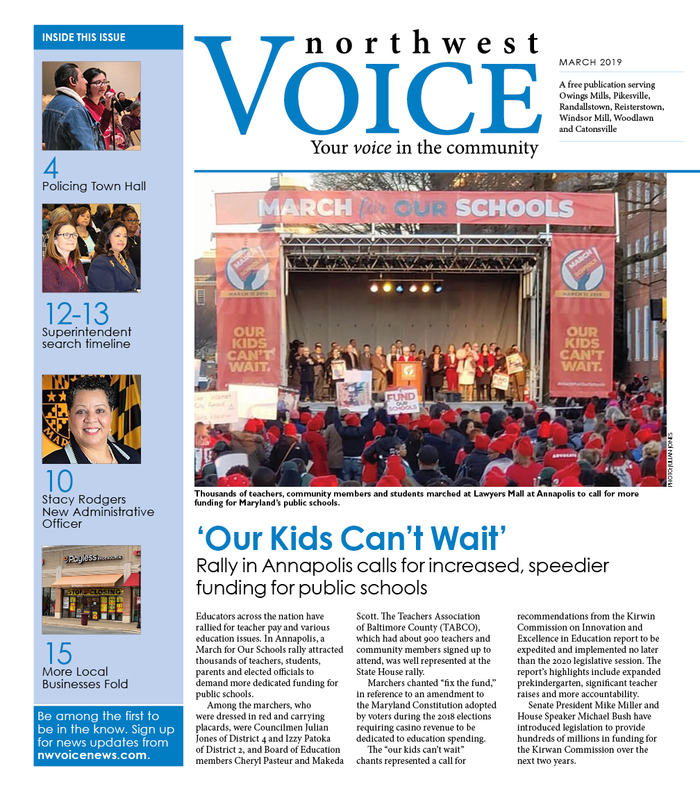 The case, Marshall’s first major defeat, was viewed as a precursor to Brown vs. Board of Education of Topeka, the landmark U.S. Supreme Court decision that declared racial segregation in public schools unconstitutional. On Sept. 22, dozens gathered at the school to commemorate the significance of the Williams vs. Zimmerman efforts to desegregate county schools. Del. 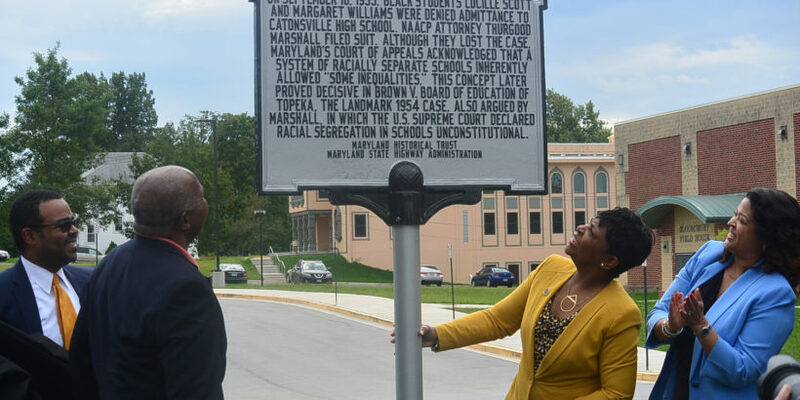 Charles Sydnor III, who represents District 44B, which includes Catonsville, unveiled a historical marker in front of the school, as elected officials, education and county representatives and community members cheered. In addition to White and Jones, historian Louis Diggs, Baltimore County Public Schools Interim Superintendent Verletta White and attorney Larry Gibson, who wrote a book on Marshall, “Young Thurgood: The Making of a Supreme Court Justice,” were present. In their remarks, Sydnor, Gibson and other speakers shared pieces of the history. Black students had to attend segregated schools in the 1930s, with some colored schools so small, one teacher could teach all grades and all subjects. Only whites could attend high schools in Baltimore County, as the county would not permit black students to attend public school past the seventh grade. The county paid the tuition for some to attend one of three schools in the city, but not the transportation to get there. Barry Williams noted that his grandfather didn’t have opportunities beyond the seventh grade, but “he made sure his daughter, Margaret Williams had education opportunities.